We were on the Island of Arran at the weekend and it poured from the moment we got off the ferry until we got back on the next day. 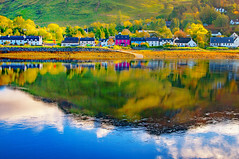 Arran is in the Clyde estuary and is described as Scotland in miniature with mountainous glens in the north, small satellite islands off its own coast ( the Holy Isle) and beautiful villages. The stand out place on this trip was the village of Corrie. 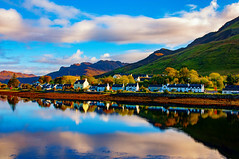 Is Corrie the prettiest village in Scotland ? 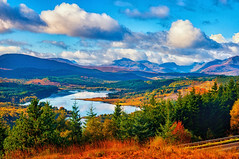 There are plenty of competitions for this title and I’d be astonished if it isn’t in the running for the Keep Scotland Beautiful wee village trophy. Every single house is tastefully painted and every blade of grass in the walled gardens the go along the seawall is perfectly cared for. Even on a wet day it was a joy to pass through. There is a small harbour at one end that includes a long-boat in a viking style. At the other end of the street are mature trees providing a canopy to the colourful cottages. If anyone asks us for a list of the prettiest villages Corrie will spring to mind. Where would you put on a list of Scotland’s picturesque villages? This entry was posted in Arran and tagged Arran, Clyde, Corrie, Island, picturesque, pretty, Scotland, villages. Bookmark the permalink.